Our agriculture sustainability goal is to have 100% of our direct farmers skilled, connected and financially empowered by 2025. One of the ways we are doing this is by working with smallholder farmers within our supply chain, enhancing their economic opportunities through our partnership with BanQu, the world’s first and only non-cryptocurrency blockchain platform. See this partnership in action and learn more about what we are doing on the ground in countries such as Uganda in our video below. Meet Nelson Chebet, one of our Nile Breweries Limited farmers, from Uganda. Nelson is one of our designated farm leaders and plays a key role in our farmer field schools, which teach local farmers best practices for the barley production. We are implementing this program in collaboration with TechnoServe, a valued partner in our work to support and empower farmers around the world. Meet Esther Nait, another one of our Nile Breweries Limited farmers in Uganda. Here she speaks with us about the impact of our partnership with BanQu, a blockchain technology company that empowers local farmers within our supply chain. Through this collaboration, we are providing farmers with access to digital payments and technology to further their economic opportunity. Learn more about BanQu and our valued partnership in the 100+ Accelerator section. Because beer comes from natural ingredients, brewing our beers relies on a healthy environment and thriving communities. Meet Grace, one of the Nile Breweries Limited lead farmers. 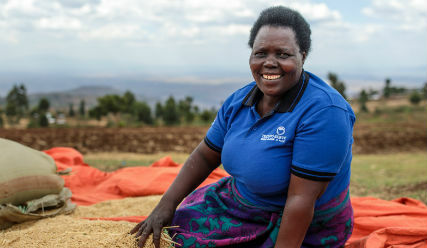 Here she discusses the day-to-day impact of climate change and how farmer training and barley research programs in Uganda are helping combat the effects, while ensuring we have quality barley for years to come. To learn more about the work we are doing in the sustainability space, visit the Our Impactsection.